About urban myths, the sound as a creative representation, and the desire to understand each other. An interview with ZimmerFrei. Q: Part of your artistic reflection is inspired by Francis Alÿs’ work, a Belgian artist, Mexican by choice, who, on the occasion of its collective performance, ‘When Faith Moves Mountains’, in 2002, publicly talked about his idea of ‘urban myth’. What is the role of this concept in your artistic production? What is it, a urban myth, for ZimmerFrei? “Because of the immense amount of material produced on a daily basis by a huge city like Mexico City, it is very difficult to justify the act of adding another piece of matter to that already saturated environment. My reaction was to insert a story into the city rather than an object. ... If the story is right, if it hits a nerve, it can propagate like a rumour. If the script meets the expectation and addresses the anxieties of that society at the right time and place, it may become a story that survives the event itself. At that moment, it has the potential to become a fable or an urban myth”. 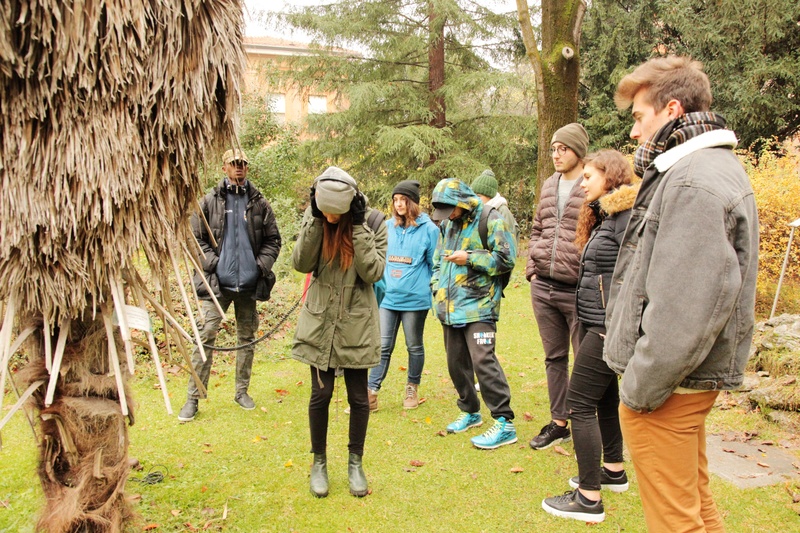 The workshops that we conduct and that we will keep conducting in 2018 do not create an urban myth in the city of Bologna, although this is the wish that drives us personally. Only in 2020 we will be able to say whether or not all the work and the series of mini-documentaries that we will be realising this year can produce something like an urban myth. We will know that only when the whole documentary will be completed, when this will be shown to the public in the same places that the film portrays, maybe in front of an audience that has never heard about its production. Q: The relationship with ‘the other’ as well as the local territory are important aspects of your artistic performances. How do you create such relationships? What are the principles on which they are built? A: Atlas of Transitions is a project that investigates transitions: movements [of people], transformations, migrations, identity changes, citizenship, the future, and it challenges our fear, the many fears we all have. Fear of change, of what and who we don’t know, fear of future, fear that the future doesn’t exist, fear that neither life nor culture can anything against economy, finance, impoverishment, dehumanisation. Nevertheless, transformations within society will never end. Atlas of Transitions acts as the project pointing at these unspeakable matters while giving timely but temporary answers, which are connected to this precise time in history and that are in relationship with the different realities that the seven countries involved in the project experience. 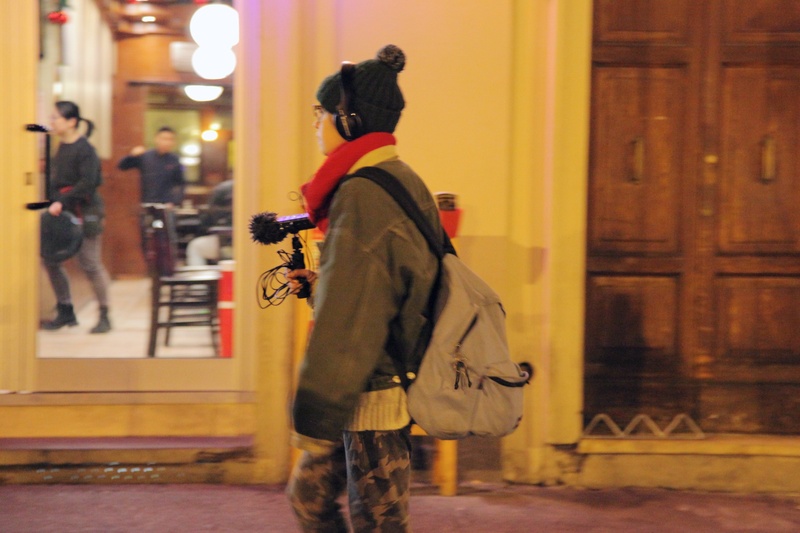 In order not to allow the fear of the unknown to dominate our work, the focus of the documentary that we are still imagining and progressively realising [through our workshops] is the re-appropriation of the local territory, of the city itself. This approach is both creative and narrative, since it seeks to break down the insecurities surrounding us, in our daily life, and [through it] the first element to fall is identity. The word ‘identity’ is a trap, a tautology. It tells us nothing about neither ourselves nor ‘the other’. We are many, and each of us is the expression of a multiple consciousness. For instance, as Anna, I have various voices inside me, talking to myself. I feel I am part of a bigger body, or a number of bodies, whether they are my extended family, my own body, into which I have grown up, and my aging body, the bodies of the other women, the social body, and, if I were Muslim, for instance, I would belong to Ummah as well, to the large religious body of the community of believers – a body that becomes tense if only one of its parts suffers. Q: Within this relationship with ‘the other’, thus, what is the function of sound? A: Making a documentary is a risky process, as its final result cannot be predicted. A documentary is made of what is available… it does mediate between, and it is mediated by, something that it is neither reality nor imagination. The very process of making a documentary may be considered as a collective performance. 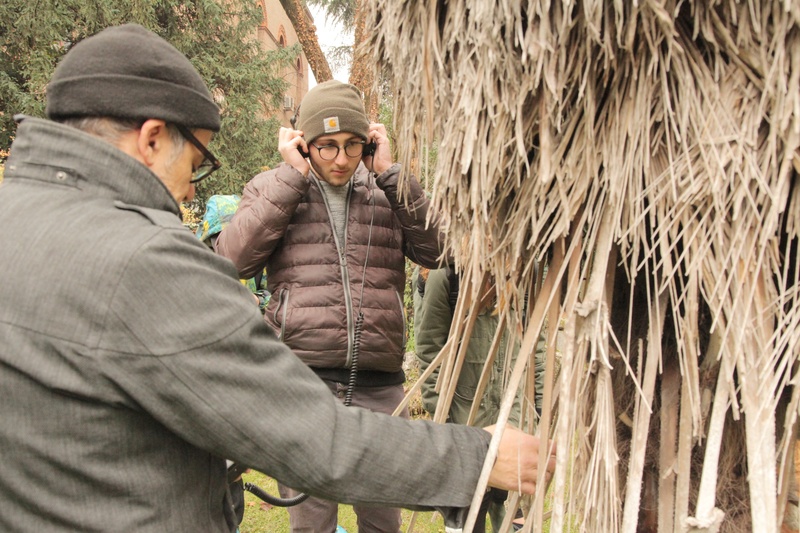 The first workshop made for Atlas, ‘Memoria Esterna’ [External Memory], which ended in December 2017, focused on the exploration of the sound environment within the urban space of Bologna. 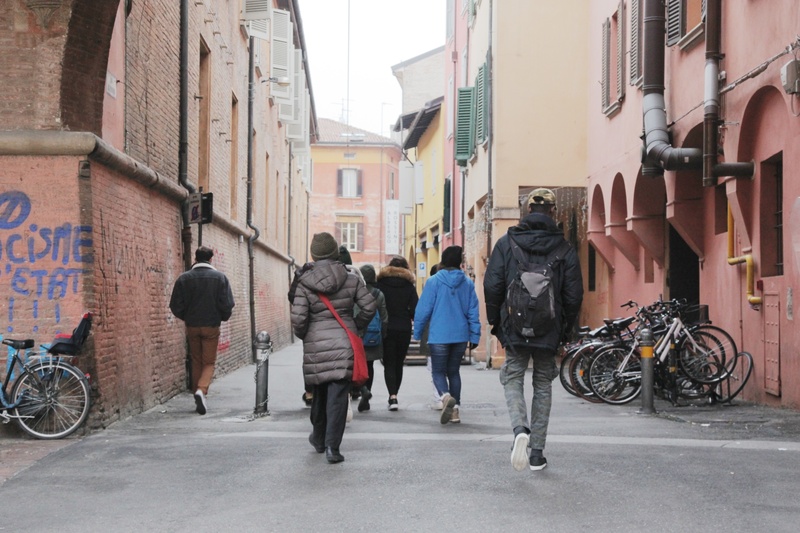 This was possible through some walks down the streets of the city, together with a group of about 15 participants with various nationalities, who aged between 16 and 24 years. Making a sound experience is a creative practice that we have been employed for years in our work. It acts as a way to share a perceptive level that is usually felt as secondary to sight. Making hearing aware, however, means that you can see things from a different perspective. In the workshop ‘Memoria Esterna’ the only clue that participants had was to stay silent and listen. Simply by doing so, and through our walks, the world showed itself as different... For instance, we had the feeling that the people around us followed a script or something, as the characters of a story would do. Of course, they were just persons on foot, but this so increased perception [of them] was enough to imagine a story and wish to tell it to someone. 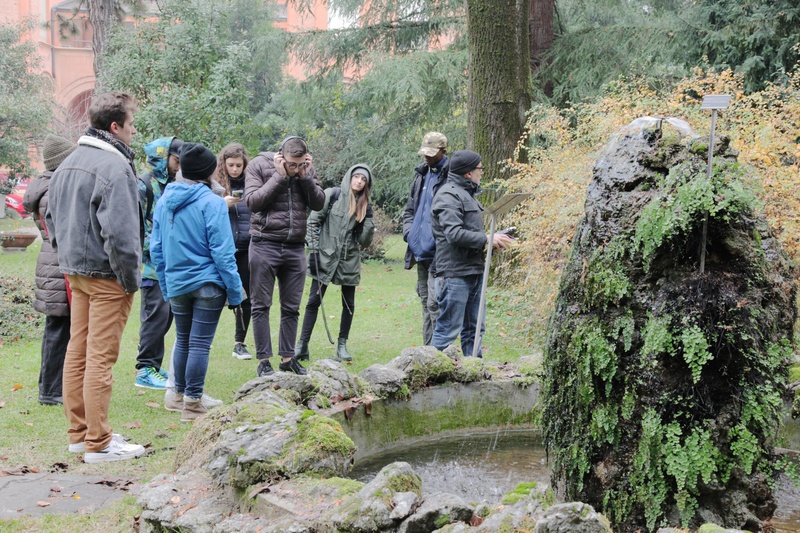 Q: What did the participants in ‘Memoria esterna’ find out during their sound exploration of Bologna? A: To begin with, Massimo and I [Anna] are not from Bologna. To us, this city is still a place to be explored, also through the production of a documentary. 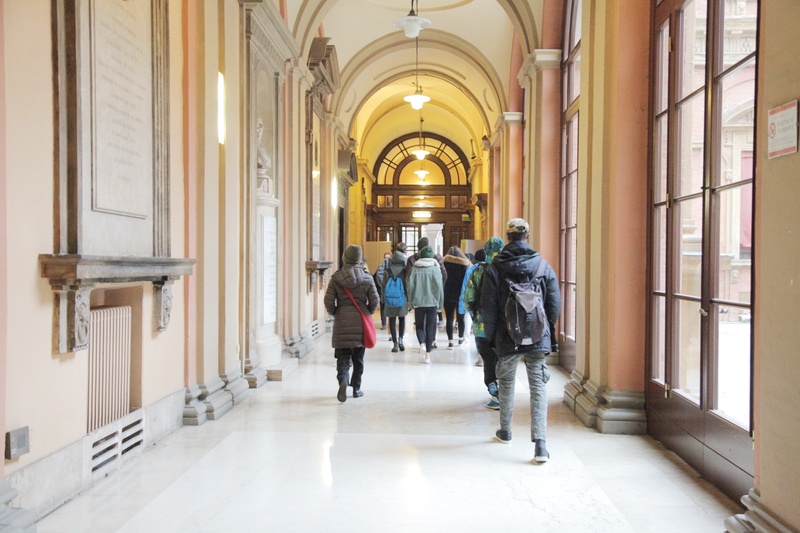 Bologna is the city of which we have become inhabitants and citizens, the city that we did choose as our own. When we come back to Bologna, we feel at home. Also for this reason, we avoided creating a clear artistic product with the people who participated in the workshop ‘Memoria Esterna’. As said earlier, in fact, our aim was the re-appropriation of the territory – we did not try to remove our fear of the unknown. 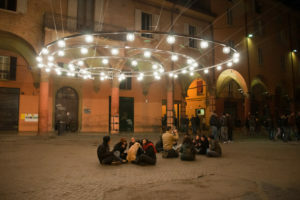 The result was that Bologna turned into a movie set by chance, a playground with rules that the troupe slowly discovered and defined, from [the role of] the participants in the workshop to the [production of] recordings. All this [practice and experience] will then be transferred to the public who will eventually watch the film, the people who live in the very same places [described by the documentary], or in places that resemble Bologna, or even in different territories. The participants in the workshop knew that we were not there to shoot a fiction film, that no one would anticipate what had to happen. Because of that, the reality [of their story] was not written anywhere. The making of a documentary is something frightening for everyone. We all feel unbalanced… there is tension when you film as well as when you get filmed. At the same time, you feel desire and fear of the other. The very act of recording and shooting are inopportune and aggressive gestures. In order to become familiar with such an uncomfortable feeling, it is necessary to make some experience together and to be all contemporaneously disoriented. What will happen then is that some of us will act as troupe while the others will be on the set, and vice versa. These guys, with us, crossed the city by walking one after the other, in a queue that was shaped randomly. Who led our sound walk knew the path; the others, instead, did not know where we were going to. Following a guide relieves from the duty to anticipate your next moves. As a result, the people who let someone else guide can stay focused on their own walk, on the sounds, on their own perceptions. We think that the participants in the workshop, first of all, have discovered the practice of hearing, and that they have experienced it and internalised it as a creative practice. Thanks to it, they can keep enriching their knowledge of the places in which they live, shoulder to shoulder with the people who live there as well, perhaps in a different way.